Dates for our 2019 Soapmaking Workshops are posted within each workshop description. New for 2019: A half day introduction to handmade soapmaking, and six Saturday Afternoon Soap Making Seminars on various soapmaking topics. Saturday Soap Seminars are scheduled 1-4 pm on the first Saturday of each month, May through October. In the event our chosen dates do not suit your schedule, please know that all our classes can be offered privately, scheduled at your convenience, and customized to your needs. Let us help you accelerate your progress! Email us for details. Complete our 'Contact Us' form above on the top right, or send email to info @ soapshed.com with any questions you may have. 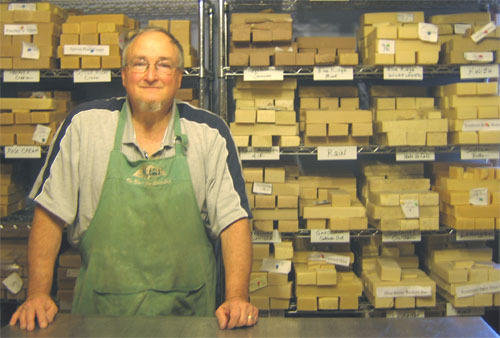 Since 2001 many aspiring soapmakers have joined Tim for weekend and week-long soap making workshops at the John C. Campbell Folk School in Brasstown, North Carolina, to learn how to make cold process Soap. We constructed classroom and workshop space at The Soap Shed which allows us to teach soap making onsite as well. The making, cutting, selling and shipping of twelve tons (24,000 pounds) of soap each year - all by hand - requires a special kind of operation, all on view for you to see and learn about when you take one of our classes. All soapmaking classes are hands-on soapmaking classes - meaning that after watching Tim demonstrate making the first batch so that you see the process and safety procedures used, YOU become the soapmaker! This fact alone makes our classes unusual, because many soapmaking classes and workshops are primarily demonstrations which allow participants to watch, but not make any soap themselves. Learn how to make soap under the guidance of a retired science professor who can help you get started, and later support you in creating your own recipes, determining your own mold, batch and bar sizes, as you step up to managing large batches or beginning a business. You can take the classes you need, as your soapmaking journey progresses. All our classes can be offered privately, customized to your needs. Let us help you accelerate your progress! Email us for details. This one day workshop provides an overview of cold-process soap making geared to beginning soapmakers and those who would like to make their first batch. Handmade soap production and processing methods (cutting, drying, packaging) will be demonstrated and discussed. We are happy to consult with you about soapmaking procedures; creating or troubleshooting your own recipes; determining bar, batch & mold sizes; or help you explore new business & sales strategies. Thirty minute (half hour) and 60 minute (full hour) sessions are available. This Full or Half Day Intensive is a private, one-on-one consultation time that will focus on you and what you need to transition to the next level of soap production that's right for you. You tell us what you need to learn and get our input about, and together we agree on what our curriculum will be. Your choice: full day, half day or multiple days. This half day workshop provides an overview of cold-process soap making geared to beginning soapmakers and those who would like to make their first batch. Participants will leave with their own, freshly-made batch of soap. This private two day workshop will help you make the decision to transition to the next level of soap production and make needed business adjustments when moving from just a few bars of soap per month to regular and significant production year round. This private,one half day workshop provides an overview of large batch cold-process soap making geared to intermediate and advanced soap makers, and will focus on batch sizes of 10-12 pounds on up to 50 pounds. This private half day workshop is geared to the intermediate soap maker who has had some experience making cold process soap on a regular basis but who has little or no experience incorporating milk into the the mix. Schedule a half day beginner's soap making workshop for your own group, and enjoy learning together with friends or family members. We'll teach you what you need to successfully make soap on your own and have a fun day doing it! Three hour workshop. Minimum three participants, maximum six. Schedule a beginner's soap making workshop for your own group, and enjoy learning together with friends or family members. We'll teach you what you need to successfully make soap on your own and have a fun day doing it! Minimum three participants, maximum six. Our Saturday soap making seminars focus on a different cold process soap making topic each time, and are held from 1:00 to 4:00pm (usually) on the first Saturday of each month from May through October. This three day workshop provides an overview of cold-process soap making geared to beginning soap makers, as well as the opportunity to make several multiple-oil batches, using various oils, butters and milks, and create recipes of your own. Handmade soap production and processing methods (cutting, packaging, drying) will be demonstrated and discussed.